1 oz. Unsalted Butter, room temp. Heat oil in a cast iron skillet that will just hold the oil & steak comfortably. The oil should sputter, not smoke, when a drop of water is added. Salt the steak liberally and place it on a pan of cracked peppercorns. 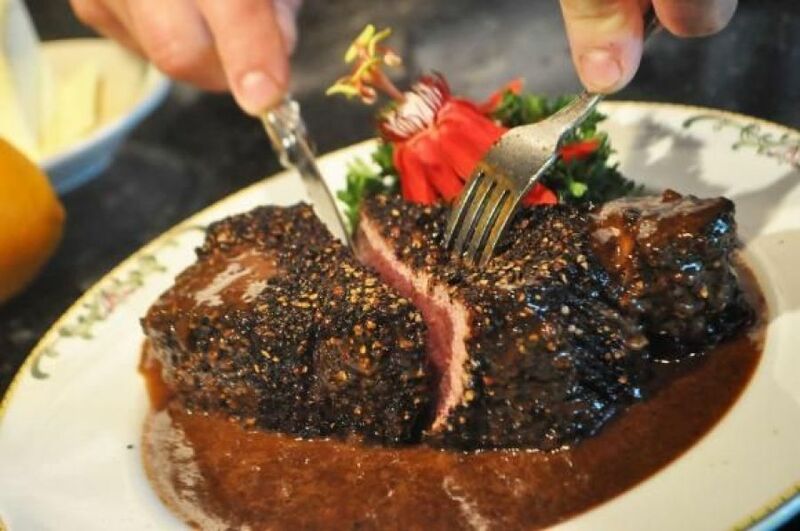 Pound the steak into the pepper until completely embedded on all sides. Fry the pepper-coated steak in the hot oil. Cook on both sides until the steak has reached your desired doneness. Note: The steak will continue to cook while you prepare the sauce. Pour off oil and return pan, with steak, to fire. Step back and add brandy. Be careful, as a very large flame may result. After flames subside. Remove steak to a serving plate. Add to the pan the fresh orange juice, Worcestershire sauce and E.H. Steak Sauce. Stir with a fork. Reduce sauce until thick, stirring occasionally. Fold in the soft butter and remove from heat immediately. Pour sauce next to the steak and serve. Note: If you are serving more steaks, scale the sauce recipe, one recipe for each steak however, use only enough oil to half submerge the steaks during the frying process. The oil will bubble and rise.